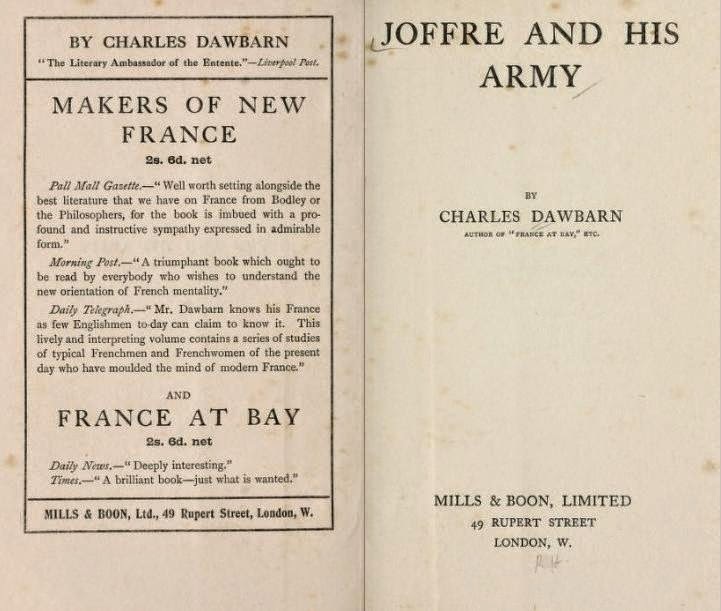 He wrote a series of books on France which led him to being described as “The Literary Ambassador of the Entente.” His publishers, which seems surprising now, were Mills and Boon! After Dawbarn retired from county chess he disappeared completely…. Mike Conroy; History of Lancashire Chess (2012), who also gives the frontispiece below. 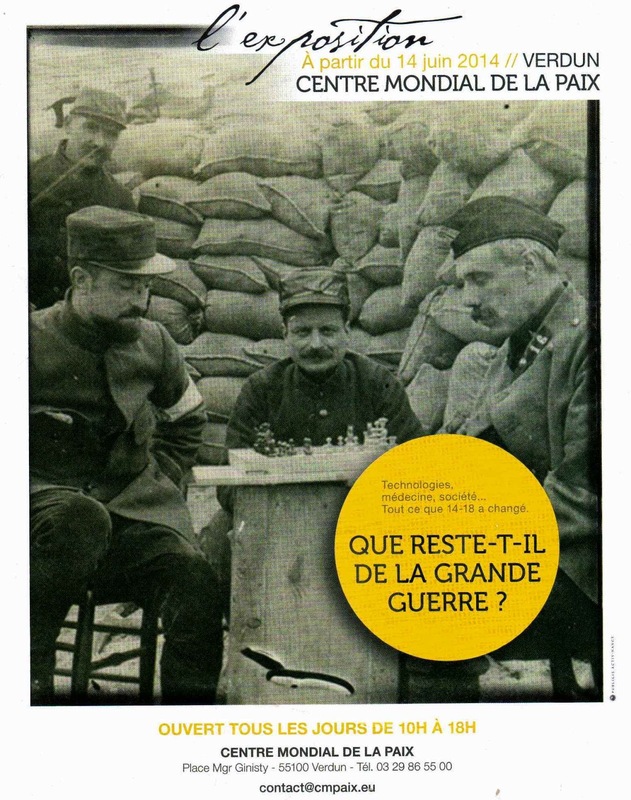 So far I have not been able to trace the original of the above poilu photograph, or date it, but The Chess Amateur of May 1915 has this note reporting on "The Daily Mail...[which]...[d]elighted chess players with a charming picture of “A Game of Chess Behind the French Lines.” The players evidently enjoyed their game – each face us depicted beaming with interest and pleasure." I wonder whether, if we discount The Daily Mail's hyperbole, it might have been the same picture. 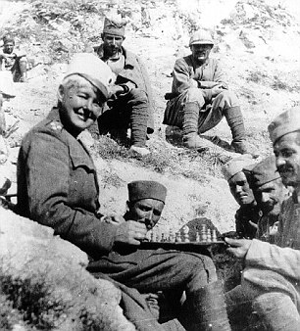 Chess in the German Trenches. And here is an image of German combatants playing - but not this time, as the reports above have it, in the past tense. Distinction for Lieut. E. A. Grieg, Chess Author. Here is the game with the original notes, but in algebraic notation. Which, in spite of the obvious difference in strength, was a pretty decent demolition job at blindfold - and played in "the awful din of battle" (a phrase used by The Chess Amateur in September 1915 when reporting on another reader who "indulged in a game or two" at the front). 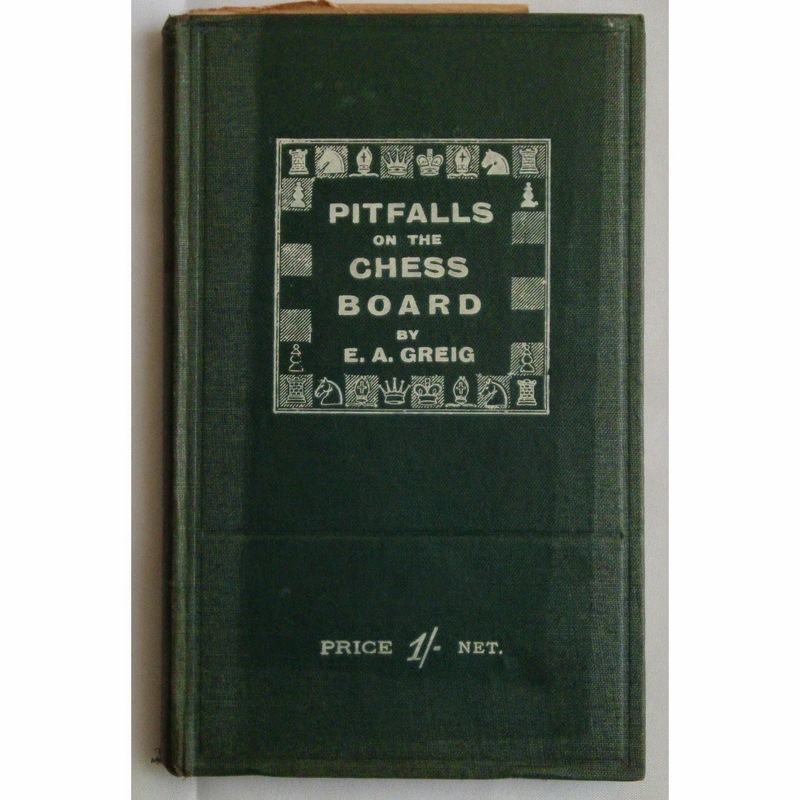 Perhaps the sporting Major Edmondson might then have shelled out his shilling for Lt. Grieg's "Pitfalls" so as to improve his game. Dear Mrs. Rowland, - I am wondering how you are after all this long time. When last I heard you were threatened with civil war in Ireland, now things are greatly changed and we are the ones in danger from the Zeppelin raids. I should like to hear how you are all getting on, and if you do as much chess as you used. I have had some right good games lately with one of the convalescent soldiers staying here. He is a sergeant and as very gentlemanly young fellow. He is expecting to leave shortly. I hope the doctor will give him a little longer. I get other chess, but not so good as a rule. She seems of bygone era with that "right good games"; and one wonders about the age of the "gentlemanly young fellow" (Miss Rudge was by then in her 70s), and whether, when fully recovered, he was sent straight back to the front. Mrs Rowlands, by the way, devised the signals code used by the Navy, and other services, to play their moves - a practice that had aroused the suspicions of the alert citizens of Golders Green mentioned in the last episode. She had, said The Chess Amateur in November 1915, explained it all, with illustrations, in her new chess column in the Irish Weekly Mail - which, evidently, wasn't widely read in the aforementioned district of north west London. In 16 November 1916, a soldier of British nationality was seriously wounded while fighting for the Serbs, allies of the British, in some of the harshest conditions of the First World War. Two weeks later, this soldier was awarded the Karageorge Star, the equivalent of the Military Cross and, by the end of the war, would be twice Mentioned in Dispatches for exceptional bravery. But this record, impressive by any standard, was not that of one of the millions of young men who thronged to the ranks of allied armies. It belonged instead to Flora Sandes, a woman from Suffolk, the courageous daughter of a village rector. While other women fought in the Serbian army and elsewhere along the Eastern Front, Flora is the only Western woman known to have enlisted and fought as a member of a regular army in the First World War. Finally, in a faint echo of the alien internment item from the previous episode, I'm grateful to St. Michael's Benedictine Abbey at Farnborough in Kent for permission to use this photograph from their blog of April 11th on the Abbey in the First World War. 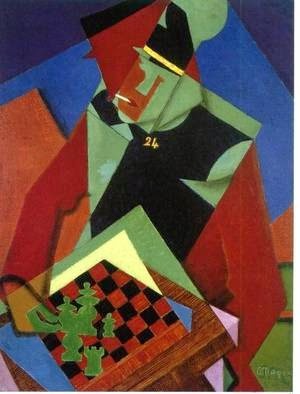 The French cubist painter Jean Metzinger was opposed to war but also served as a medical aide to the poilus in the French lines (info from here). This is his "Soldat Jouant aux Echecs" from 1916, painted apparently during his mobilisation, but sparing us a depiction of the horrors he would have witnessed. ...our correspondent also mentions that to relieve the weariness of the long days in hospital, he was successful in inducing some of his fellow patients to take up a study of chess, and expresses the hope they will continue the study in more peaceful times. With thanks to Dom Cuthbert Brogan at St. Michael's Abbey. 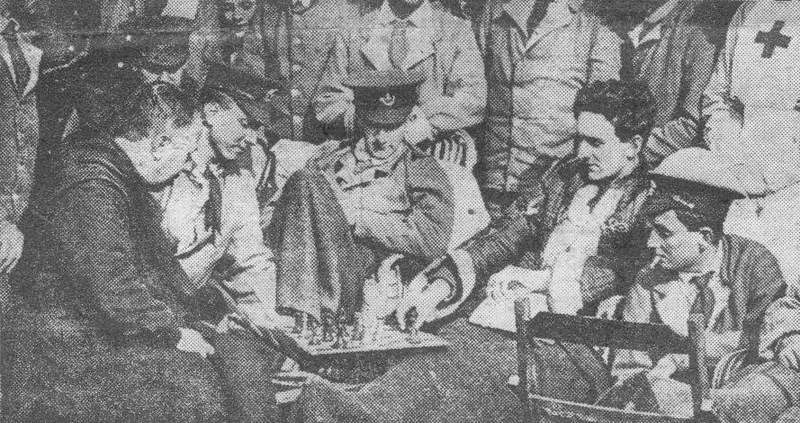 There are some atmospheric vintage photographs of military personnel, not British, playing chess on this page at www.chess-echecs.com - but there appears to be no further information on the site about who or when.